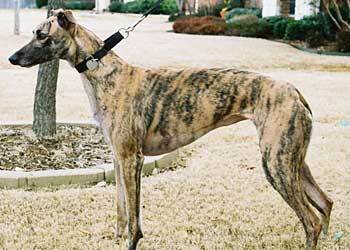 Mingo, aka Rapido Mingo, is a beautiful fawn-brindle 2-year-old female, born October 4, 2002. Her sire is Rapido Marco and her dam is Rapido Babe. Mingo is half sibling to Ariel, Cali, Flame and Flare. Mingo's maiden race was October 23, 2004 at Ebro in Florida, and that was essentially her one and only. Mingo is a sweet, loving little girl who is learning all about life in a home. Her black-tinted muzzle gives her quite an exotic look. 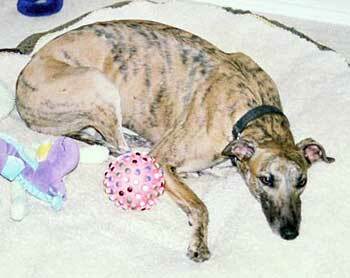 She lives with 4 greyhounds in her foster home and gets along well with all. It is not known at this time if Mingo is small animal or cat tolerant.